For SRAM (static random-access memory) chips, a part or the entire chip will not be operable even if just one out of millions of transistors cannot work correctly. Figure 2310 shows a failure of S-RAM cell induced by uncontrolled diffusion of Ni under a spacer. 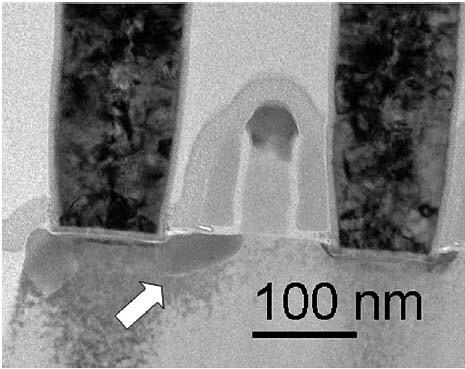 Note that the failing S-RAM cell was first localized on a wafer by the voltage-contrast method using scanning electron microscopy (SEM). S. Pokrant, R. Pantel, M. Cheynet, Physical characterization by valence electron energy loss spectroscopy, 83 (11–12) 2364–2367 (2006).